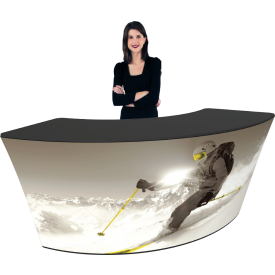 Quickly and easily make an impact with a portable display solution! 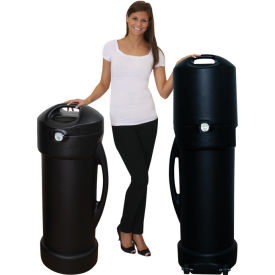 Portable displays are perfect for use in trade shows, conferences, corporate events, retail/commercial environments and more. Portable displays, as the name implies, are designed to be fast and easy to set up, take down, store and ship. 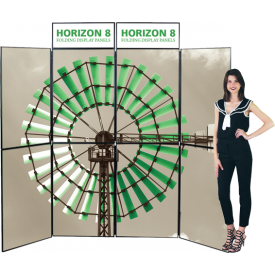 These displays are ideal for companies exhibiting at multiple shows, and include everything from full-scale exhibits to banner stands, table covers, collapsible displays, counters, and much more. Portable displays are often an inexpensive option when compared to fully custom exhibits. Despite this, portable exhibits and modular kits can easily have the same impact as a large scale display, and off-the-shelf kits can be customized to meet any need. 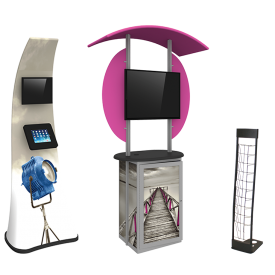 Portable exhibits and banner stands come with custom, high-impact graphics, and accessory options like lighting and literature racks can be added to a display for additional branding and messaging opportunities. Browse through a wide selection of stylish, portable displays. There is a solution available for every budget! 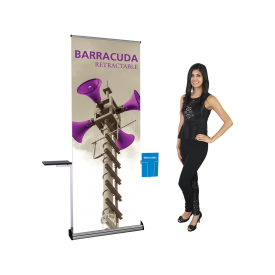 Banner Stands are one of the easiest and most portable types of displays suitable for any environment. 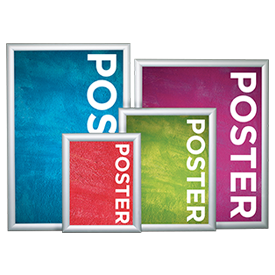 Choose from one of the widest selections of stylish banner stands, some with basic features and functionality, and others with lots of bells and whistles. 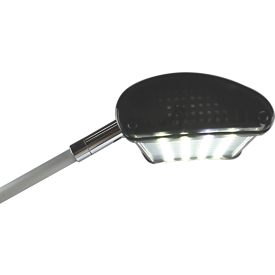 Retractable, Telescopic, Spring Back, Fabric Frame and Illuminated Fabric Frame options are available. 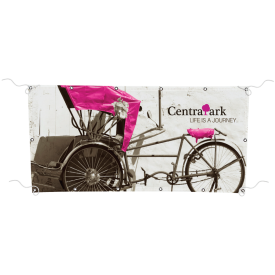 Find the perfect banner stand today! Hanging Banners clearly and effectively broadcast your brand and messaging in any environment. 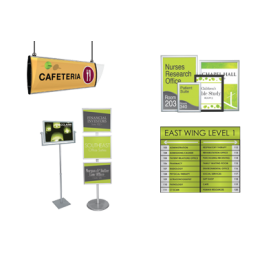 Choose from customizable and versatile Indoor or Outdoor Hanging Banners or the wide-ranging line of Hanging Structures to find the perfect advertising, messaging or branding solution. 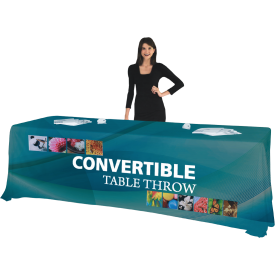 Table covers are available in printed and imprinted options and various sizes. Table runners add a polished look to any table top. 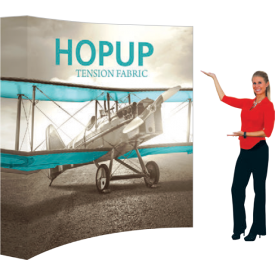 Collapsible pop up displays are a highly portable display option that are available in a wide variety of sizes and feature many customization options. Choose from multiple product lines, including Hopup, Embrace, Xclaim and Coyote. Folding display boards offer a professional, portable solution that are simple to assemble. These panel displays come in a large range of sizes, from table top all the way to 20ft options. Portable display kiosks are the perfect option for presenting multi-media messaging to your audience. Kiosks come with custom graphics for additional branding opportunity. Counters act as a natural greeting area for your audience, making them the perfect addition to any display. Browse our extensive line of counters today! Present information to your audience quickly and effectively with literature holders. Perfect for maximizing exhibit space. Proper lighting in a display can make all the difference when it comes to attracting an audience and making your message stand out. Display lighting can be used for a multitude of displays. Quality constructed Shipping cases are the number one option for protecting your exhibit and can be used for practically any display. These heavy duty cases are one of the best investments you can make!